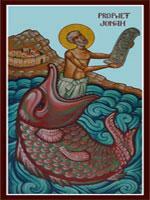 The Ninevites trembled at the voice of Jonah, the son of Mattai, and took refuge in penitence by watching, fasting and prayer; and by tears and groans the sentence of judgment pronounced by Jonah concerning the destruction of Nineveh was annulled. Blessed be the Compassionate one who turned them from evil to good. The origins of the Nineveh Fast in the Syrian Orthodox Church can be traced back to the fourth century AD. This can be inferred from the memres and hymns of St. Ephrem, the Syrian. Initially the fast was for six days, but now it is only for three days starting on the third Monday before the Great Lent. The 3 days Fast had been neglected through the ages. Mar Dionysius Bar Salibi states that Mar Marutha of Tikrit was the one who enjoined it on the Church of the East first in the region of Nineveh. Armenians embraced this practice of the Syrians calling it (Sorep Sarkis). The Copts did the same during the time of Patriarch Anba Eprem, the Syrian. Historically, this fast is one of the most rigorously observed fasts in the Church. The faithful traditionally refrain from food and drink for three consecutive days, from Monday till Wednesday. Some observe the fast by refraining from food and drink from morning till sunset during the three days. The church exhorts her faithful to at least refrain from meat, fish and dairy products during the period of fasting. The faithful are urged to go to church after this fast and receive the Holy Qurbono. In the Old Testament, preparation for a special holy occasion included fasting and prayer. The New Testament often mentions fasting. Fasting is clearly not optional inasmuch as Jesus Christ said, regarding fasting “When you fast” (Matt. 6:16), rather than “If you fast.” Fasting is the change of every part of our life, because the sacrifice of the fast is not the abstinence but the distancing from sins. Fasting is an essential aspect of practicing the Orthodox life. You cannot be Orthodox and not fast. Unfortunately, many in the Church today do not participate in this grace-bestowing practice. Fasting in the Orthodox Church has two aspects: physical and spiritual. The first one implies abstinence from food, such as dairy products, eggs, fish and all kinds of meat. Spiritual fasting consists in abstinence from evil thoughts, desires, and deeds. The main purpose of fasting is to gain mastery over oneself and to conquer the passions of the flesh. It is to liberate oneself from dependence on the things of this world in order to concentrate on the things of the Kingdom of God. It is to give power to the soul so that it would not yield to temptation and sin.